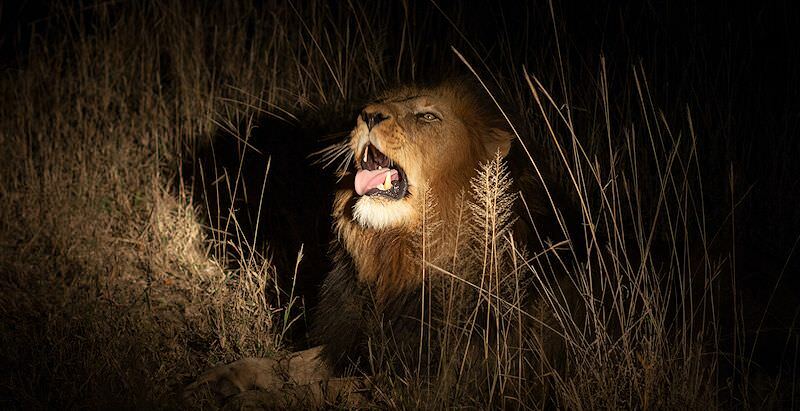 Encounter the elusive nocturnal animals of the Kruger National Park on an evening safari in the wilderness. An evening safari in the Kruger National Park is always a safari highlight. 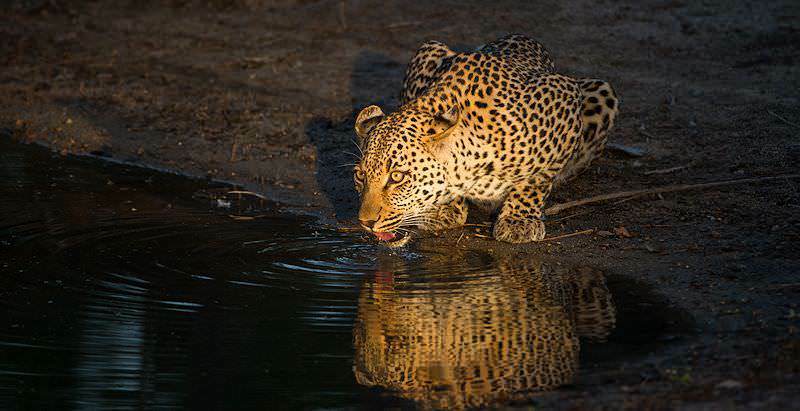 Depending on the lodge or camp you are staying at and the time of the year, a nighttime game drive typically departs between 16:00 and 17:00 and returns after dark. You are truly entering the bush at its most magical time. As the sun begins to sink further and further beyond the horizon, the nocturnal world awakens. Hippos pull out of their pools for hours of covert grazing. Cats shrug off the idle habits of the day and ready themselves for the hunt. Burrowers ditch the safety of their dens for nighttime feasting. Owls fill the evening with haunting hoots and jackals begin to sing. This is a great time to find a pride of lions on a fresh kill, snarling at circling hyenas, or a leopard dragging its meal up a tree. Though spotting lion, leopard and hyena in the dark is incredibly thrilling, it is often the shyer animals that are practically exclusively spotted at night that provide the most memorable encounters. Porcupines are the largest rodents in Southern Africa. They are monogamous and typically live as mated pairs of adults, often sharing up to six burrows between them, and raising their young and defending their joint territory together. However, they typically forage alone. Many people mistakenly believe that porcupines shoot their quills to defend themselves. Their actual defense is charging into their attacker and stabbing them with their quills. Large-spotted genets occur exclusively in South Africa. Despite their appearance, these cat-like critters are not actually related to cats and form part of a medium-sized mammal family known as viverrids. Genets are typically spotted in trees when a flashlight catches the glow of their large, luminous eyes. Long-necked, rather bushy-tailed and short-legged, these striking creatures boast a beautiful combination of spots and stripes across their coats. Like genets, African civets are also viverrids, though not arboreal. They are usually observed on the ground, and look somewhat like giant genets, also sporting a striped and spotted pattern. Civets are, however, significantly larger – shoulder height average of 40cm (16 in) – and are rather stocky animals. They are best known for the sharp scent produced by their perineal glands, which was commonly used in perfumes before the creation of synthetic musk. Though common throughout much of Africa, aardvarks are very, very rarely spotted on safari, and you will find the excitement particularly tangible. These bizarre-looking pig-like creatures typically withdraw from their burrows at sunset to gorge on ants and termites. Normally encountered as solitary individuals, they pair up during the breeding season and only mothers and their young will share burrows. Aardwolves fall under the same family as the hyena and under the class carnivora. However, aardwolves rarely eat meat and live almost entirely on insects – mainly termites – and emerge from their burrows at night to forage. They are slightly larger than civets, with distinct manes running down their backsides, and fluffy tails. Yellowish and grey in color, they typically have several stripes along their backs and bands around their legs. And finally, there’s the bush baby. Both thick-tailed and lesser bush baby occur in South Africa and are frequently spotted in trees. Also known as greater and lesser galago respectively, these adorable large-eyed, large-eared primates are delightful to behold. The Afrikaans name for ‘bush baby’ is ‘nagapie’, which translates to ‘little night monkey’, which is a testament to their extraordinary jumping abilities – and, of course, their undeniable cuteness.